I got a lot of stamping done last night while watching the Wisconsin Badger hockey game. I'm thrilled they were two for two this weekend. There's still hope that they may make the college hockey tournament and if they go on a good run, get to the national championship game that will be just a short subway ride away from me in Washington, DC. If they do, I am so there! On to the cards now . . . Here’s my card for this week’s sketch at Page Plans. I took my cue from the prominent heart shaped panel on the sketch and chose to go with a love-themed image on my card. 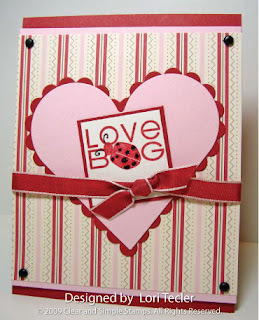 I used the “love bug” stamp from the Valentine bundle available from Clear & Simple Stamps. The image is stamped in Riding Hood Red ink on Shimmery White cardstock. I went back and used a fine point black pen to trace over the love bug’s antenna and added some Black Diamond Stickles to the bug’s spots, too. I cut the pair of hearts using Nestabilities dies. They coordinate perfectly with the colors in the Candy Lane (I always want to type “Candy Cane” when I write about this paper—am I the only one who thinks that way??) designer paper I used to cover the cardfront. The stripes on the paper helped me to line up the 4 brads at the corners of the card to be somewhat straight. I wrapped a piece of pretty Riding Hood Red taffeta ribbon around the card to finish it. This one is for this week's Mojo Monday sketch. I got a request from my mom for baby girl cards and I thought this one might fit the bill. I used one of the bunnies from the Lucky Bunnies set from The Greeting Farm for the main image. I colored the bunny image with Copic markers and added some white Fun Flock to the bunny's belly and ears. The balloon image was stamped a second time, cut out, and attached to the image panel with dimensionals. I paired the image with a girly pink and yellow floral paper from Memory Box. 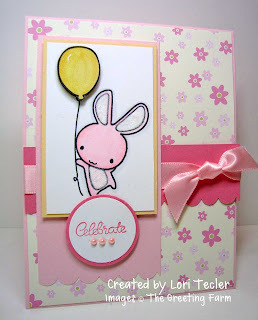 I added a simple "celebrate" sentiment from the Happy Chef set and accented it with three tiny pink pearls. And, finally, this one is for this week's Viva la Verve challenge. It came together in about 15 minutes. The only casualty was my Cuttlebug C plate, which cracked while I was cutting some of the shapes for my card. I guess a trip to AC Moore or Michaels is in my plans for this afternoon . . . The "twist" to this week's challenge was that no patterned paper was allowed. So, I made my own using the border image from the Hundred Hearts set, stamped repeatedly in red ink on Pink Pirouette paper. The hearts "locked" together nicely to make a pretty pattern. The clear stamp made it really easy to line up the image. 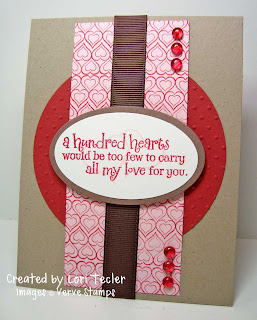 I stamped the hundred hearts sentiment for the focal point of the card. It's hard to see in the picture, but I stamped the pair of intertwined hearts from Sweet Valentine over the sentiment in soft Pink Pirouette ink. All of them are fabulous Lori! Love the bunny with the balloon! These are great! Love the colors on them all and think the bunny card is adorable. I also think the scenes you did in the last post are awesome! Loved the chick--the clouds and snow caps were fabulous additions. Fantastic card Lori! Love the colours! Hi, Lori. Beautiful cards! All of them are just fabulous. Sorry to hear about the CB casualty, but this card is so cute! Love your stamping - totally thought that was DP! Looks great!